Everyone wants happiness that endures. So why are so few people able to achieve it? Having spent over two decades researching the answer to this question, Drs. 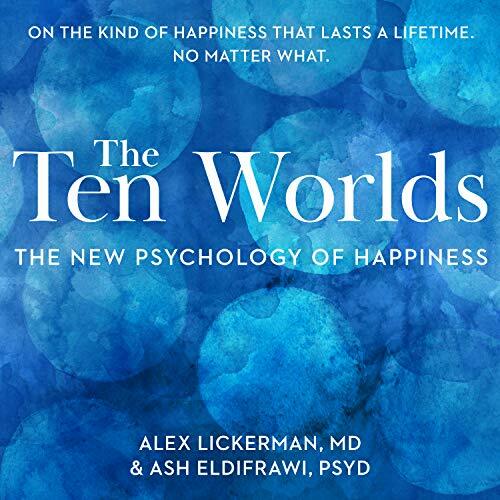 Lickerman and ElDifrawi argue in this eminently practical and groundbreaking new book--presented as a series of Platonic dialogues recounting real-life patient experiences--that enduring happiness eludes us because we're profoundly confused about what happiness is. According to Lickerman and ElDifrawi, we all have nine basic beliefs about how to achieve lasting happiness, and all of them are wrong. Unfortunately, these nine erroneous beliefs about how to achieve lasting happiness--what Lickerman and ElDifrawi term the core delusions--are so deeply embedded in our thinking that we can't escape them. In fact, they're so foundational they give rise to nine basic life-conditions, or worlds, through which we all continuously cycle. From lowest to highest, they are: Hell, Hunger, Animality, Anger, Tranquility, Rapture, Learning, Realization, and Compassion. Yet because these worlds are created by delusions, the happiness they produce is fragile and temporary. But there exists another type of happiness. A happiness that can't be destroyed by anything. A happiness that's absolute. Though few have ever experienced this kind of happiness--the transcendent happiness found in the tenth world, the world of Enlightenment--it's a happiness, Lickerman and ElDifrawi argue, that can be experienced by us all. Founded neither in mysticism nor the supernatural, the world of Enlightenment is discussed for the first time as a psychological state created by a belief in a core truth, a core truth that if we fully embrace will at last enable us to achieve the kind of happiness we all want. A happiness that endures no matter what.